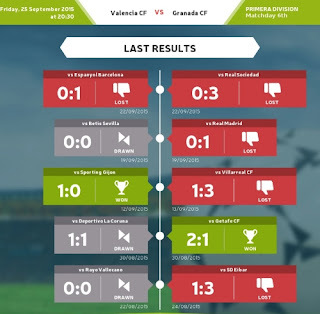 Valencia CF is in a sort of mini crisis and I say mini because its still very early in the season, but on the other hand the start has been so bad that there is a genuine fear that the bad results are going to continue and that we've already lost too much momentum that we aren't going to be able to make up for it even if the team started getting results consistently. Last match was a must win for Valencia CF to kick start its season, but the team slipped up again and couldn't even get one point from it, as Espanyol managed to achieve a small 1-0 victory. This much the stakes are even higher, the team is playing at the Mestalla, in front of the home crowd and arguable against an weaker opponent that the last one. 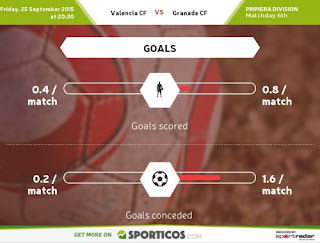 We know that opponents form and results don't matter much though, as teams that have conceded quite a lot of goals against other teams have conceded zero against Valencia CF, so past results and form of other teams seems meaningless when they face Valencia CF as Valencia's issues of scoring goals keep on persisting. Granada CF are bottom of the table after 5 matchdays and while that doesn't tell us too much, by the end of the season they might even end up in the middle of the table, it does tell us that they are in a poor form, it does tell us that they are playing bad and it does tell us that winning in this game is absurdly important and anything else, but a comfortable win would be a gigantic disappointment. Valencia CF coach Nuno Santo can't count on the injured Jose Luis Gaya and he's likely going to miss the match against Lyon in the Champions league as well, he still can't count on Andre Gomes as he is out injured as well, while Barragan, Aymen and Santi Mina have been given a rest. Back in the squad in Ruben Vezo who was injured for a while, though I'm not sure if he was injured all this time, it could have been or he just might not have found himself called up. I'm certain that he'll field the strongest squad that he can, considering some of the injuries and stuff, but I'm expecting Parejo, Enzo, Feghouli, Negredo and Paco all in the squad. The issue is he's been playing Javi Fuego almost every match and I don't know if he can avoid not playing him tonight, since Enzo Perez also played last match and he always seems extremely tired at around the 60th minute, he obviously has huge stamina issues. Tactics: High defensive line, own half pressure, short passing, counter attacks, long shots. Don't know how the match is going to play out, I'm hoping out for a win, I'm hoping there will be more fluid play in attack and we'd score more goals, but I've been thinking that for so many matches now and it hasn't happened. I'm going to be optimistic here though and predict a hard fought 2-1 win.